Il est grand temps de rallumer les étoiles | One quality, the finest. If you’ve ever said, “It was so surreal,” you’ve been echoing Guillaume Apollinaire, born August 26, 1880, poet, writer, art critic, and yes, surrealist, who coined the term. His mother was a Polish immigrant and his grandfather was a commander of the Swiss Guard in the Vatican, where Wilhelm Albert Vladimir Apollinary von Kostrowitzky was born. His father is a mystery. Mamma cruised the casinos of the French Riviera and Paris, trailing two sons with her. Guillaume Apollinaire, the French version of his name, assumed the identity of a Russian prince. He settled in Paris and became friends with the artists and musicians of the day including Picasso, Chagall, Braque, Satie, and Duchamp. 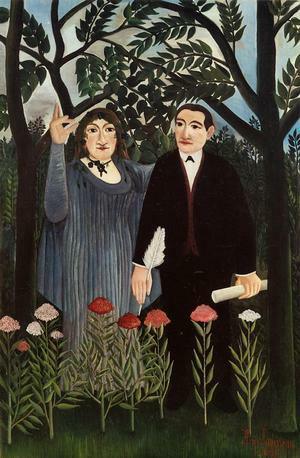 The painting of him, above, is by another good friend, Henri Rousseau; the woman with him is his lover Marie Laurencin, painted in 1909. His brushes with the law as a thief led to him being held for a week for suspicion of the theft of the Mona Lisa from the Louvre in 1911. His writing included semi-pornographic novels in addition to his poetry. His collection, Alcools, was published in 1913. Here is one of the most famous poems, Le Pont Mirabeau sung by Léo Ferré. In order to get French citizenship, Apollinaire joined the French army in World War I. He suffered a serious head wound on the Front and was trepanned – a hole was drilled in his head in order to relieve pressure. He never really recovered his strength and died of Spanish flu in 1918, two days prior to the armistice. While he was recuperating from the head wound, he wrote the play La mamelle de Tirésias from which today’s quotation is taken. Il est grand temps de rallumer les étoiles (eel eh grahn tehm duh ralloomay lez aytwahl) means “it is high time to relight the stars.” I can well imagine that someone who saw the horrors of trench warfare would want to reawaken what was beautiful in the world. His legacy is his poetry, which is part of any study of 20th century French literature. This entry was posted in Literature, People and tagged Alcools, Guillaume Apollinaire, Henri Rousseau, Il est grand temps de rallumer les étoiles, La mamelle de Tirésias, Léo Ferré, Le Pont Mirabeau, Marie Laurencin, Picasso, Satie, surrealist, theft of Mona Lisa. Bookmark the permalink. I loved the cafe photograph and the Rousseau painting – made me want to hop on the next plane to Paris. I’m so glad you enjoyed it! Stop by anytime. Pingback: Les femmes sont tellement plus belles | One quality, the finest. Pingback: Pour l’amour de Paris | One quality, the finest.